Having garnered accolades from disparate corners of the film and critical world since its release last year, the film Enemies of the People is assuredly many things. Most importantly, it is a record of the violence ordered by the Khmer Rouge in the late 1970s that killed as many as 1.7 million people, as detailed by “Brother Number Two,” the regime’s second-in-command, Nuon Chea. 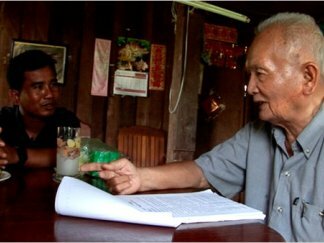 But the film also functions as strong evidence of the dogged determination of investigative journalist (and the film’s co-director) Thet Sambath, who dedicated 10 years—often at the expense of his personal life and bank account—to befriending Nuon Chea, and convincing him to share his story on film for the first time. The tale is made all the more remarkable by the fact that much of Sambath’s immediate family were victims of the genocide. It is a testament to the filmmaking skill of Sambath and co-director Rob Lemkin that the viewer is able to feel empathy for cadre-level executioners who did much of the killing, and even Nuon Chea himself, without ever losing sight of the horrific crimes that were ordered or committed. The need to place blame feels largely absent from Enemies of the People. Instead, we watch Sambath, whose beatific demeanor seems perpetual, struggle with the difficult questions of why and how the mass killings happened. The rippling effects of the Khmer Rouge are still being wrought on Cambodian society today, and the murders carried out on Killing Fields remain a moment in human history that is difficult and uncomfortable to contemplate. But what is even more disturbing is the idea that the crimes were made possible by the complicity of a culture and society that simply did not know how to stop them. Click “Read More” below for a Q&A with co-director Rob Lemkin. STF: Start by telling us how you got drawn into this material and story. Lemkin: I actually went to Cambodia in September 2006 with a plan to develop a film about the Khmer Rouge going to trial. So I was interested in meeting two or three of the Khmer Rouge leaders, and Thet Sambath was my fixer, he was my translator. And I realized very quickly that Brother Number Two, Nuon Chea, was the key guy to really get to know. But when Sambath and I went together to film with Nuon Chea, he told me nothing. And I realized that the two of them had a very interesting relationship, even though Nuon Chea was saying nothing. And on the way back to the capital city of Phnom Penh, in those days it was about a 10-hour drive because the road was really bad—Sambath told me all about what he was doing for the previous, at that point, seven years. So gradually we evolved a plan that we would make a film together. He hadn’t planned at that point to make a film. He was just simply trying to find out what had happened. And it was actually seven years before he picked up a camera, about a month before I met him. And he didn’t pick up a camera to make a film, he picked up a camera because I think after about five or six years he had started to record on minidisc the conversations that they had had. And he recorded about 1,000 hours of their conversations, and he was recording them because he thought at any moment this old man may die, and no one will believe what he was getting. And then just before I met him, he had started to videotape these conversations, again, with this idea that he wanted to prove that this man, this person that was so feared and reviled and mythologized in Cambodia had actually really spoken to him in this way. STF: Can you talk about the experience of showing this film in Cambodian exile communities? Lemkin: It’s been really exciting actually. We made the film as a sort of universal statement so that it could have some kind of appeal and meaning to anybody who wants to watch it. But when it comes to Cambodians—I suppose ideally the audience for this film would be Cambodians in Cambodia. But the film has not been given a permit to be shown in Cambodia. It’s been shown in a very limited way there. But in this country, which has a very large Cambodian diaspora—there’s about 300,000 Cambodians living here, perhaps 90% because of the killing fields. The refugee float that came in the late 70s and early 80s was all caused by the disruptions that happened in Cambodia and Indochina during that period. So all of these people are living here, and the younger people, what they call the “1.5 generation” which are the people born in Cambodia or the refugee camps in Thailand and then come to live here and grow up as Americans, and the second generation—born here in the U.S.—find a huge gap between them and their parents, who are first generation refugees who don’t really want to talk about this traumatic experience. And this film, perhaps because it’s done through the prism of a younger person—if he’d come to live in the U.S. he’d have been a 1.5 generation migrant—they can relate to that. Because in a way the film is not really about what happened in the Khmer Rouge, the film is really about how does somebody who was affected by the Khmer Rouge as a child find out and come to terms with what happened to them as a child. So people have been really, really I think energized, galvanized by it, particularly in the large [exile] communities. There are two large communities. One is in Long Beach, just south of Los Angeles. Another one is in Lowell, just outside of Boston. With the community in Long Beach we very recently did a project where survivors of the killing fields met by video conference, live, the people who are in this film. So for the first time ever, the victims of the killing field spoke to the perpetrators, and they had a three-hour dialogue. Although [the film] is about very difficult, dark, violent and horrible episodes, the people see a way forward, out of this miasma. And this process that we went through in Long Beach is leading to a lot of community activity—both in Long Beach and in Lowell. STF: What’s it been like for Sambath to have this film out now? Lemkin: I think he’s really excited. The film is doing well here, but it’s also having a huge impact in places like the Balkan region, where people are seeing a lot of echoes with their experience. For Sambath, I think that’s a very exciting idea—the idea that his very lonely work, that he’d done for so many years, has been able to touch people. And not touch people in some kind of passive, curious way, but actually touch people in a very kind of active and forward-looking way. So he’s very pleased and very satisfied with what has happened. But at the same time that has to be tempered with the fact that it’s still quite dangerous to deal with this story in Cambodia. It’s dangerous for him. There have been some times where he has been driving near his farm, near where his father was killed and where Nuon Chea also lived, so the location in itself is quite symbolic. But it’s very far away from where he and his family live in Phnom Penh. So he’s quite often driving in rural areas, and there’s been a few times this year when he’s been run off the road in his car by people unknown. And also—I just mentioned the Long Beach project we did a couple of months ago—the people who were in that, Khoun and Suon and another person who was not included in the final cut of the film, the three of them crossed back into Cambodia from Thailand and were tracked by police and people. And they have received visits from, shall we say men with guns in the last few weeks. So the whole thing is very much on a knife’s edge. I don’t think the film can be, in the immediate future, shown in Cambodia around communities and villages because it’s still quite a dangerous story to tell. Audience: What did you learn about mass murder through this film? Lemkin: In a very simple nutshell, it’s done by ordinary people. And no matter how we might think that we could not do it, I think all of us could be involved in it if the situation is such that that kind of thing happens. Because I think the two people that we really focus on in this film, Khoun and Suon, are not people who have ever done any kind of criminal, violent, evil—if you want to put it that way—behavior since. And in that three year period, from 1975 to the beginning of 1979, they were responsible for killing, I mean Suon killed about 300 people. Khoun killed over 3,000 people, but I don’t think they’re different from us. I learned a lot of things, but I think that would be at the top. Audience: Have any of Sambeth’s tapes been used in the prosecution of Nuon Chea? Lemkin: So Nuon Chea was arrested in September 2007. The process of the United Nations trial is that he was investigated for, it turned out, three years for an indictment which they then served in September 2010. It’s 750 pages long and he’s charged with genocide, war crimes and crimes against humanity. The investigating judges asked for us to provide the film to them as part of their dossier of evidence against Nuon Shea when the film was first shown at the Sundance Film Festival of January last year. We declined to provide it to them, not because we want to impede the trial or the tribunal process or the justice process, but because the context in which this film was made and in which these interviews and accounts were obtained were such that—principally Sambath—but Sambath and myself had presented ourselves as not being agents of the court. We were not working for the court, we said to these people—Nuon Chea and everybody else we filmed and asked please tell us what you did, what you know happened 30 years ago—we are not officers of the court. We are interested in getting this information into the public domain. So for the first four months of 2010 the court attempted to subpoena material. I live in Oxford, England, and someone came to my house from the court to try and take the film. And we declined, we resisted that for the reasons I have given. And it has been very controversial, we’ve come under criticism for it. But we’ve stuck by that. The trial itself of Nuon Chea will start as early as March or April of this year, so possibly in two or three months, but more likely in June. It will last two years minimum, possibly three years. He’s on trial with four other people. And when the court issued their order in which they kind of desisted from their subpoena operation—they said they would no longer pursue us through the courts—they said they would actually use the film. The film will be shown on PBS in June or July and they’ll get a copy then. So we have no problem with the film being used in the court, but there is a problem with actually handing it over directly because that is not the context in which the testimony was granted or obtained. Audience: After you decided to make the documentary with Sambath how did you convince Nuon Chea to let you film him? Lemkin: Basically, Nuon Chea had been working with Sambath for seven years—well maybe about five years sort of in depth at that point. Sambath and I made the film together, we own the film together, we are joint partners, it was a joint English-Cambodian venture. So Nuon Chea was very happy to be filmed by me, working with Sambath. What he wasn’t happy to do, however, was to answer very secret and difficult questions about what he and Pol Pot had gotten up to and what they had decided in various meetings. So when you see in this film the very kind of internal, the most secret admissions that he makes, I was not there. I couldn’t be there for him to say that kind of thing. He was very happy for it to be used in the film, but he wasn’t comfortable to speak like that in the presence of a foreigner. So the way that we worked was that some of the material that you see in the film when Nuon Chea is talking precedes my involvement with Sambath. So it’s from August 2006. And then we had about a year of filming where I wasn’t there by any means, all of the time, but Sambath was going and interviewing him and we were working on what questions and what kind of things needed to be done. Audience: Do you think that there’s somebody responsible for these killings, and if a finger is pointed at somebody, shouldn’t it be a leader? Lemkin: To be honest, I don’t really think that when you get 1.7 million people killed like this, that you can pin it down to one person. We’re making a second film from the material that we have, and in that film you’ll see that Nuon Chea’s own family was completely devastated by the killing fields. He lost 40 of his own relatives—even his uncle was killed. And when his uncle was killed and he learned about it at the secret central committee meeting in late 1975, he was actually too scared to raise any objection. And I think that gives you an idea of when you get into this world of mass killing, you are dealing with things that are much, much greater than individual people. Forces that are more elemental, more scary, more structural, more profound are at work. And I don’t think that blaming one person or another person, or even five people or ten people gets you to a point where you really understand what’s happened. Audience: Initially we were led to believe that they were political killings, but later it seems to be more ethnic. Could you comment on that, and what does Sambath think about that? Lemkin: Essentially, what had happened—and this will come out in our second film which will be on the DVD when we release it—what happened the Khmer Rouge is that you have two sides of a very secret communist party that had grown up underground and was very secretive in the way it operated. Suddenly it captured state power in 1975 and ran the country. But in coming to state power it was not a unified, controlled organism. It was actually a party in which there were two parts who were in very deep conflict with each other. The Communist Party of Kampuchea [Khmer Rouge] had been set up by Ho Chi Minh, the founder of the Indochinese communist party, in 1930. And all of that goes back to the struggle against French colonialism. So the problem inside the Khmer Rouge was that Pol Pot and Nuon Chea came to power within the Communist Party as people who said, “We are true Cambodians.” As [Nuon Chea] says, “I fight for the nation, I don’t care about individuals, the nation is more important.” What he means by that is, “We are the true representatives of the Khmer people. We are the true representatives of the Cambodian spirit that goes back to Angkor Wat,” and that great civilization that had been in place 1,000 years earlier. The other people who were in the Khmer Rouge were much more happy—this is simplifying it hugely—to deal with the Vietnamese big brother that was next door, and which regarded the Cambodian communist party as basically an adjunct. That thereby became an ethnic conflict, because people who were seen as being ethnically connected to Vietnam were [considered to be] in a suspect community. So when the ethnic minorities were being targeted, as you see in the film, these people were not being targeted because they were ethnic minorities. They were being targeted because that ethnic minority was determined as being a group that might have sympathies with Vietnam. And the conflict between Vietnam and Cambodia within the communist party, within the Khmer Rouge was the primary problem. And this kind of nationalism—which became a very racist, supremacist chauvinism, which is what Nuon Chea and Pol Pot really advocated to separate themselves from Vietnam—is really at the heart of why this violence became so extreme, and had such resonance in the country. And it has huge resonance even now. The reason why the story is still scary is that the government is quite worried that if the government puts Nuon Chea in the witness box in say, June of this year, and he starts making statements about, “I am the true spirit of Cambodia”—actually there are many people in Cambodia who believe that. There are many Cambodian people here, in America, who believe that there is a real pure nationalism about the Khmer Rouge that should be celebrated. Because they still now see Vietnam—Vietnam came in in about 1979 and actually militarily occupied the country for nearly 10 years until the demise of the Soviet Union, which was its backer—even now, many people see the current government as being a Vietnamese stooge. So you still have a huge problem of nationalism and ethnic identity in Cambodia. And, forgetting communism—because I think communism maybe has nothing to do with it, nearly—the appeal of Nuon Chea going on television every night and saying, “I am the true Khmer. We were fighting for the sovereignty of the country, we were defending the country,” will still have a huge resonance in Cambodia, even today. I mean, it seems unbelievable, but it is the truth.